Performance Windows® Embedded 7 Tablet PC 10.1"
Large, sunlight viewable LED display—a brilliant 10.1 inch multi-touch capacitive display with Corning® Gorilla® Glass 2. Lightweight and thin—weights less than 3 pounds and is less than an inch thick. 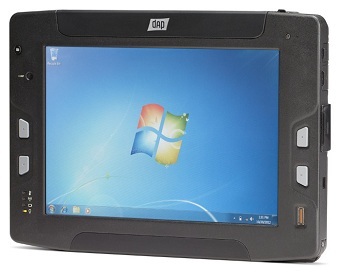 Windows® operating system—ships standard with Windows Embedded Standard 7. Multiple I/O ports—including USB 2.0, Ethernet serial and HDMI. Additional ports via the dock and expansion connectors provide the most I/O available in a tablet, as well as easy integration with legacy peripherals. Ultra rugged—sealed to IP65, MIL-STD-810G Standard and certified for a 6 foot drop. Also features magnesium-alloy construction and Corning® Gorilla® Glass 2. Dual cameras—with a 5 MP back facing camera and a 2 MP front facing camera, the MT1010 is equipped for video conferencing and document scanning. Barcode scanning option—optional 1D/2D scanner available. Expandable for the future—specify the technology needed at the time of purchase and later add functionality with backpack modules such as a Smartcard reader, RFID reader or other wireless capabilities. Multiple communication options—Bluetooth v4.0, Wi-Fi 802.11 a/b/g/n, GPS and optional WWAN with Gobi™ 3000 afford unparalleled connectivity. Advanced sensors and feedback technology—accelerometer, magnetometer and vibration motor.